In my previous posts, I have covered details on getting started with Python development on XSA. I am going to continue this series forward and now talk about setting up a central application router for your applications. Again, I am using the same pyapp project in this blog post as i did in the previous ones. If you have not been following along, you can find the code for it at this link. The application router itself is programmed in Node.js and so, you are going to have to step away from Python for a bit and set up routing within your application using a bit of Node! In the xs-app.json file, declare the homepage to be the index.html file and set up a route to the core-py application as shown below. The “/core-py(. *)” part is a regex expression that looks for URL path patterns and redirects to internal applications and services accordingly, acting as a reverse proxy. In the package.json file, specify the approuter node module provided by SAP as a dependency. You must install the node modules that your application uses before deploying the application to XSA. 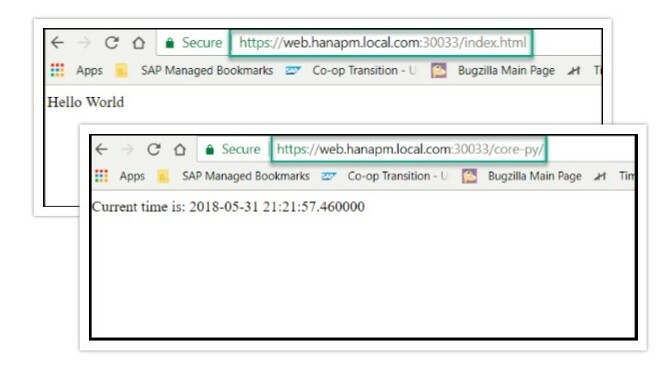 This is different from when you are developing on the Web IDE for SAP HANA where the package dependencies are installed automatically for you. To install the required packages, navigate to the app-router directory, configure npm to download from the SAP Registry and run the npm install command. If you do not have npm (node package manager) configured on your machine, you can follow this link to get that done. 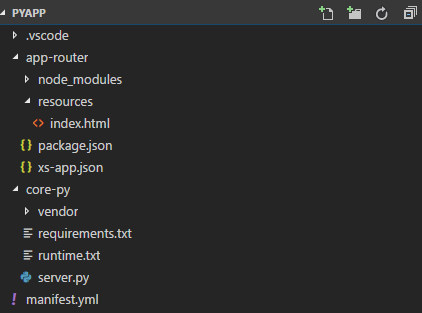 This should install the packages outlined in the package.json file to the node_modules directory located inside the app-router directory. Now, you are ready to deploy the application to XSA and run it. Awesome! You’re already halfway through setting up full security for your XSA application. You should now be able to authenticate users trying to access your application. After the xs push command is done, there should be two applications deployed, namely core-py and web. The URLs for both applications should be outputted in command line tool as shown below. If you open the URL for the web application, you should be redirected to the XSA login page. Once you have successfully logged in, you should see the index.html file which outputs simple “Hello World”. If you replace the “/index.html” from the end of the URL to “/core-py/”, you should be redirected to the core-py application which would output the current time like the pyapp from previous examples. If you are getting an error in loading the webpage, make sure you have added a mapping for web application URL in your local hosts file. To authorize users for different applications, you are going to make use of the xssec library provided by SAP. In this example, you are going to set up user authorization for the core-py application. Modify the requirements.txt file in the core-py directory to include dependency on xssec. Execute pip download from command prompt to download the xssec library to the vendor directory of your application. Refer to my last blog for more explanation on why this is needed. The xssec node module provided by SAP needs to be specified in your package.json file in the app-router directory as well. Navigate to the app-router directory and install the xssec node module. Bind the myuaa service to the core-py application to enable user authorization in the manifest.yml file. Modify the server.py file to incorporate user authorization in the application logic. Deploy the application again using xs push. If you open the URL for the core-py application, you should be denied access. This is because you have to go through the application router to be authorized to access the core-py application. Thus, open the URL for the web application, log in if prompted, and change the end of the URL from “/index.html” to “/core-py”. This should now show core-py application page which outputs the current time. That’s it! You have successfully set up complete user authentication and authorization for your XSA application. Kudos to you for making it this far! 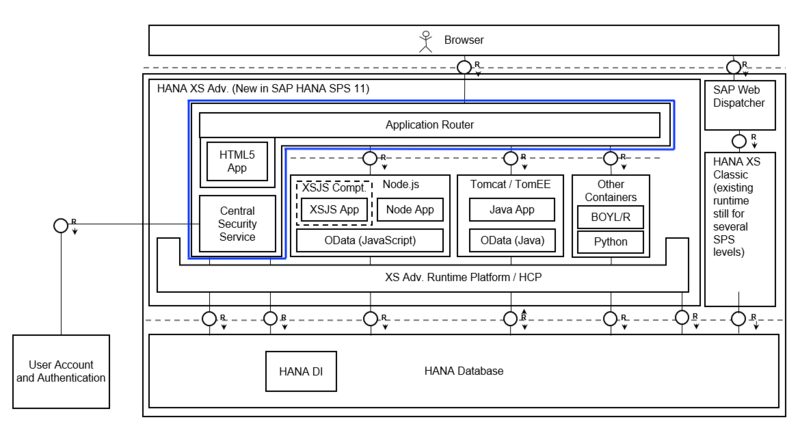 Stay tuned for more blogs on SAP HANA Database access and doing cool stuff with Python on XSA! You can also access the complete code from this blog on this link. If there is anything you would like me to demonstrate being done on XSA using Python, please comment below!! Also, if you have been following my blogs and have previous Python experience, I would love to hear about what you like the most about Python and if there are any crazy libraries you really love using. Feel free to comment below!! I am struggling with getting a cloud connector to work in CF with Python. However, I do not find a way to get the bearer token for the proxy call. How would that look like in python ? From what I understand, you’re having trouble getting the bearer token which would fill in the “token” variable in your headers. If that’s correct, I am just about to publish a detailed blog about how to obtain access (bearer) tokens for XSA applications and send HTTP requests the way you are in the attached code snippet. Stay tuned and that should answer your question! If that’s not actually your question, let me know! I am trying above code with encrypt=’true’ in dbapi.connect. I am trying run this code in cloud foundry. I am completely struck. The requirement that “only secure connections are allowed” is a server-level setting. I don’t know if there is a chance for your admin to relax the setting for a testing period. The python connection parameters are documented here. The details depend on the encryption libraries you are using (SAP CCL or OpenSSL) but you need to specify a public certificate that matches your server’s private cert. By default for OpenSSL the client looks in ~/.ssl/key.pem. More details are provided in SAP Note 1718944. Thank you very soo much for your suggestion. Now I am able to connect to server without any issues. Below are the steps I have followed. Created my own self signed certificate using openssl and hardcoded the path of both keystore and trust generated by openssl command. I don’t server certificate, So I have mentioned explicitly as sslValidateCertificate = ‘false’. And it finally worked after 3 days of Struggle. Hi Raveendra: thanks for taking the time to describe what you did. It will help others avoid 3 days of Struggle.